MAGICAL MELODY: What the Bleep! AT LAST, A FILM FOR US PRACTICAL MYSTICS! Are you ready for a spiritual film that combines quantum physics, multi-dimensional visual effects and animation, a dramatic story and interviews with leading scientists and mystics? What Happens When You Combine Today's Cutting Edge Scientists & Mystics? Can Science And Religion Really Be On The Same Path? On The Same Planet? In The Same Movie!? She is literally plunged into a swirl of chaotic occurrences, while the characters she encounters on this odyssey reveal the deeper, hidden knowledge she doesn’t even realize she has asked for. Like every hero, Amanda is thrown into crisis, questioning the fundamental premises of her life – that the reality she has believed in about how men are, how relationships with others should be, and how her emotions are affecting her work, isn’t reality at all! The people who were interviewed in "What the #$*! Do We Know?!" were chosen based on a number of criteria: books they’d written that were read by the filmmakers, lectures and presentations that they’d given which had been attended by various of the filmmakers, and recommendations by others in the experts’ respective fields. Ultimately, we chose these people to interview because their professional work was germane to the topics being addressed in the film. Still, the filmmakers do not necessarily support each and every statement made by all the interviewees. By the same token, it’s also true that the people themselves who were interviewed in the film do not completely agree with each and every statement made in the film. Many professional perspectives are presented. The filmmakers chose to represent them all in the film, but it could never be possible in a film– or, perhaps, in life! – to get a group of 14 extraordinary people such as these to agree completely on a single cosmological view. No matter where the "Bleep" opens, it sells out and then plays for weeks. The sell-outs have confounded and interested distributors to the point that "What the Bleep Do We Know!?" has partnered with a major distributor, Samuel Goldwyn/Roadside Attractions, who is booking theaters around the country for the "What the Bleep" National Release in September. WHAT THE BLEEP IS GOING ON??? Science, Spirituality, Humor and a New Paradigm: “What the #$BLEEP*! Do We Know! ?” is a wake-up call to the hundreds of thousands of people who are searching for a voice somewhere in this fragmented culture, who have been awaiting a catalyst." It has arrived! This bold, funny, unique work goes to the heart of the human dilemma. It challenges and lays waste the old paradigms of thought, and places responsibility squarely where it belongs – on individual human consciousness. Bored? Resigned? Cynical? “What the #$BLEEP*!” will rock your world and when you leave the theater, your life will never be the same. Morose? Melancholic? Living the same repetitious days again and again? “What the #$BLEEP*! provides incisive insight while making you roar with laughter! Alone in your thoughts about the world and your place in it? “What the #$BLEEP*!” offers an expansive view and provides hope, a stairway leading out of and above the din, and true freedom! “What the #$BLEEP*! Do We Know! ?” is a unique cinematic creation - really three films in one, interwoven like a DNA helix, into an original tapestry. It’s a documentary. It’s a story. It has mind-blowing special effects. These three elements combine to bring about a film experience that will rock your mind and lift your soul! It’s a new genre about a New Worldview for a new audience. 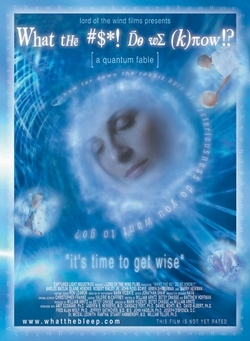 This outrageous film plunges you into a world where quantum uncertainty is demonstrated – where neurological processes, and perceptual shifts are engaged and lived by its protagonist - where everything is alive, and reality is changed by every thought. It has been called by some theater goers “The Handbook to ‘The Matrix'.” Like “The Matrix” it shows you a greater reality behind the one we all accept as true, and you have the ability to create absolutely anything from your own thought while laughing all the way! The difference between this film and that movie is that this isn’t science fiction. It’s even stranger. It’s real. And it’s the first film to say it. And it does so boldly and with a BLEEP of a lot of humor. And it’s being proven every day by minds like these. “What the #$BLEEP*! Do We Know! ?” gives voice to the modern day radical souls of science, bringing their genius to millions. These maverick heroes at the cutting edge of their fields are at the forefront of a Paradigm shift even greater than those of the geniuses who preceded them. And this shift involves the greatest uncharted territory yet – Human Consciousness itself. “What the #$BLEEP*! Do We Know?” says that science and spirituality are not different modes of thought, but are in fact describing the same thing. And it brings the power back to the individual man and woman as it demonstrates creation as the god-like capacity of every individual. Hollywood doesn’t write films like this because they think you are too stupid to understand challenging concepts and too lazy to do anything more than sit and eat popcorn. They don’t even hear your rumble and the rumble of countless others on your way to fill the theaters. The one people are talking about. . . And coming back to see again and again and again. And because of this - nothing is ever going to be the same. “You create your own reality.” We’ve been sold the message for years by teachers from Deepak Chopra to Anthony Robbins. But get real — isn’t it just New Age pap for an overindulged Baby Boomer population determined to outrun their own mortality? Not at all, says author and physicist Fred Alan Wolf. It’s pure verifiable science — quantum physics, the science that recognizes the spiritual dimension underlying all reality, the science that says we have a direct impact on the reality we experience. “Quantum physics runs our world,” explains Wolf. The term “quantum” was coined by Max Ernst Planck who studied light at the turn of the 20th century. “Quantum,” meaning “single unit,” is derived from the Latin word “quanta,” which means “whole amounts of something.” Planck was the first to discover the “quantum effect” that Albert Einstein built upon in 1905, revolutionizing physics with the “photo electric effect” and winning the Nobel Prize. “We wouldn’t have lasers, computer chip technology, the DVD or magnetic levitation trains without it,” Wolf explains. OK, but what does this have to do with our spiritual paths and the lives we are living? According to a new film, "What The #$*! Do We Know?," opening locally August 6th — everything. The brainchild of William Arnzt and the product of an intensely inventive collaboration between writer-producer-directors Arntz, Betsy Chasse and Mark Vicente, "What The #$*! Do We Know?" is an irresistible cosmic romp that suggests that quantum physics is the biggest reality show in town, and that we are the co-wizards behind the curtains of our own lives, making them a heaven or a hell. "But it couldn’t be a purely feature film, such as 'The Matrix,' either, says Vicente. “It would have been relegated to pure fantasy, and we wanted the respectability of science.” So the hybrid of live action drama, animation and documentary was born. When the film opens, Amanda, played by Marlee Matlin, is a self-hating, cynical photographer whose life is riddled with pain, struggle and disappointment in love. “Amanda became an every-person, an amalgam of all of us. Our central question was: ‘How do we go from being a victim to not being one?’” says Chasse. How indeed? By rewiring our neural nets, responds Dr. Joe Dispenza, a chiropractor and author. Dispenza’s concept is an intoxicating and seductive one because it invites our direct participation. The neural net is the neurological network of emotional associations that generates the reality we create. Dispenza says that, like heroin addicts, we are addicted to our emotions, and it’s not just psychological, it’s biochemical. “We bring to ourselves situations and people that fulfill our chemical needs,” elaborates Dispenza. We are creators of our own reality — gods, if you will — and the more we step out of the trance of the past, interrupt the old programming, the more we get to create the lives we really want. “If people could get away from the big opium box that is TV and experiment with this information, they would be amazed,” says Vicente. Chasse used the information to manifest her beloved mate. Prior to doing this film, she says, “My love life was disastrous. I didn’t understand I had any power. Once I understood, I would get up every morning and set a clear intent to bring into my life what I wanted.” It worked. The film is astonishing audiences and creating a “tremendous excitement akin to falling in love,” beams Vicente. With concepts about the nature of reality and spirituality backed by leading-edge science as startling as these, do the filmmakers believe the film will successfully penetrate the mainstream? You bet. It has already shattered the limited vision of many a theater distributor who “didn’t want to give the film a booking because they didn’t think the audience for it existed,” says Arntz gleefully. During its first nine weeks, 46,000 people lined up around the block to view the film. In Oregon and Arizona, theaters sold out and hundreds of people on any given night have been turned away only to return the following night to see it. Many people see the film three or four times. Science without religion is lame, religion without science is blind. -Albert Einstein, in "The New Convergence"
Darkness cannot drive out darkness; only light can do that. Hate cannot drive out hate; only love can do that. Hate multiplies hate, violence multiplies violence, and toughness multiplies toughness, in a descending spiral of destruction. The chain reaction of evil must be broken, or we shall be plunged into the dark abyss of annihilation. -Dr. Martin Luther King Jr.